Torrential rain has caused major flooding in Townsville with hundreds of residents being evacuated from their homes. The Petbarn Foundation are currently providing support to both people and pets affected by this natural disaster. Petbarn Foundation was born in 2012 with a purpose of providing support for rescue organisations and pet related charities, no matter how big or small that dedicate their time and effort into caring for animals in need. Petbarn Foundation raise money through a number of initiatives throughout the year. At any one time over 2,000 Australians are estimated to require support from a Seeing Eye Dog. To help reduce this figure, the Petbarn Foundation and Seeing Eye Dogs Australia (SEDA) are urge Aussies to get behind Petbarn Foundation annual fundraising appeal to assist Australians who are blind or have low vision. 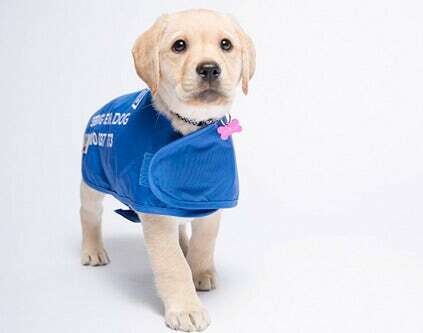 "It takes a lot of time, love, patience and money to raise these special working dogs that will one day become the gift of independence for people who are blind or have low vision," said Leigh Garwood, General Manager from Seeing Eye Dogs Australia. "Last year’s successful fundraising campaign through the Petbarn Foundation has enabled us to train six dogs who are all doing well. We're once again calling on everyone's generosity to support this year's appeal," added Garwood. The Petbarn Foundation encourages Australians to open their hearts to a pet in need of a forever home. In partnership with the RSPCA, more than 140 Petbarn stores nationally will hold a "Clear the Shelters" event, whereby prospective pet parents are able to meet a number of lovable pets in need of a new home. The aim of the event is to find forever homes for a number of pets that have previously been displaced for a variety of reasons. All pets have been assessed for re-homing suitability and vet checked. Importanlty, the Petbarn Foundation aims to find long-term solutions for these beautiful animals across Australia. Having a pet as part of your family is a wonderful experience and the Petbarn Foundation is delighted to play a role in not only helping pets in need find new homes but in this process enrich the lives of people as they welcome a new member of the family through adoption. Petbarn Foundation raise funds for animal charities through the Tree of Hope to help assist animals their care over the busy Christmas period and year ahead. Petbarn customers have the opportunity to purchase $3, $5 or $10 to hang the decorations on the Petbarn Tree of Hope. All donations collected on behalf of Petbarn Foundation are distributed to the nominated animal rescue group that often rely on the generosity of the community to help fund the cost involved in rehabilitating pets and preparing them for a second chance at a happy and healthy life. Donations are collected and distributed to our shelter partners to help animals in need. Education on responsible pet ownership. Online donations will go towards assisting people and pets affected by the Townsville Floods. Last year’s successful fundraising campaign through The Petbarn Foundation raised $397,379 which enabled 13 more Seeing Eye Dogs to be trained.